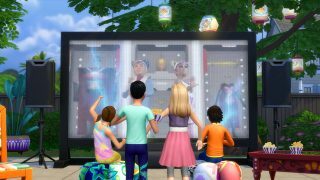 The Sims 4 Movie Hangout Stuff Pack* is out this week, giving your Sims the stuff they need to throw a great backyard movie screening. There’s a new Movie Projector Screen (that looks great in- and out-doors), tons of new decorations, and even a Popcorn Popper. But what good is a movie night without movies? 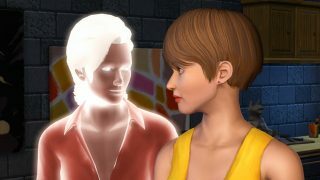 There are 10 movies in The Sims 4 Movie Hangout Stuff, all of which were put together using footage from The Sims 3 – continuing a fun trend dating back to The Sims 2 which featured movies and TV shows using The Sims gameplay. Want a peek at the movies your Sims can watch in The Sims 4 Movie Hangout Stuff Pack? Consider the descriptions below as short trailers for the full thing. Zombies! 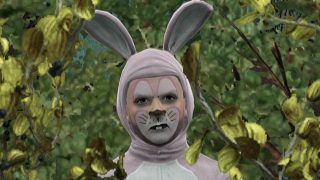 The Dead are rising – and they’re hungry. Can they be stopped? 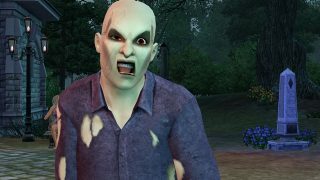 The classic horror yarn comes to life with a classic Sims spin. Who doesn’t like camping? This flick employs the visual styles and tropes from classic teenage horror cinema, where a weekend of fun in the woods of Moonlight Falls is met with chainsaw-wielding good times. 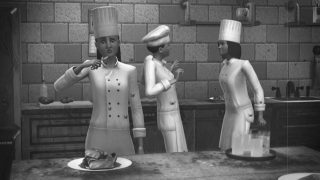 This silent slapstick film introduces the three Khlumzee sisters as they take over the kitchen of a 5-Star Hotel. Little did the Hotel staff know that calamity follows the sisters like a bad smell. From Freshman to Senior year (to Super-Senior even), nothing is done by the books on this Campus. Streakers, WooHoo, and feuding mascots fill this college comedy. 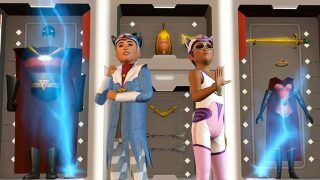 The world’s greatest cat burglar takes on an international jewel-smuggling operation, only to discover it’s led by a mad industrialist who plans to create a monopoly on life and wreak havoc on the world’s citizens… or something like that. 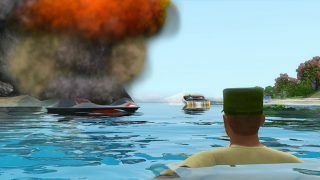 There are explosions and a chase sequence on the high seas! Why sweat the plot details? 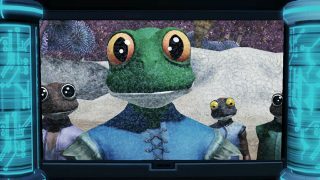 This is the voyage of the Starship Simulation… Simbots, Frog Men, and Kung Fu fighting (and more lens flare) fill this space opera. Romance comes to life in the world of Roaring Heights. But a budding romance is cut short by an outstanding arrest warrant. Can love outlast a life sentence? One can only hope for time off for good behavior. After looking for love on a dating app, our heroine connects with her soulmate. A supernatural spin saves this romantic comedy from ending in tragedy. 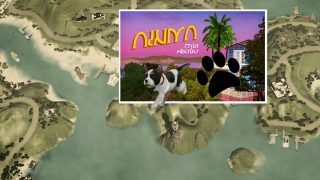 A pup wanders away from home in pursuit of his feline nemesis – only to find himself lost in the great big world. Missing his owner, this dog will overcome anything to make it back home to his beloved owner. A nefarious supervillain has increased the earth’s gravitational pull! Meteor showers plague every corner of the earth! Have no fear, the SuperKids are here! Can they save the planet from certain doom? We had a ton of fun putting these movies together, and we can’t wait to hear what you think once you’ve seen them in-game! Looking for more? Check out this cool The Sims 4 Infographic, and tips on building the perfect bathroom.